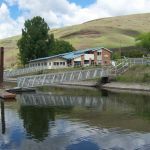 Ask fellow campers about "Boyer Park & Marina / Snake River KOA" and nearby attractions. This is probably the best camp we have been to in years. It was an Old State Park so the sites are plenty wide and the view is beautiful. The river is at the camp and you can fish or use your boat if you would like. You can walk down or drive to the dam and lock. You cannot drive across the dam with LP tanks. But that is fine we plan on going down the other Road along the Snake River. The view is wonderful seeing the wheat fields along the way. 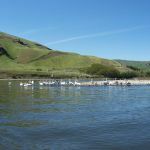 We camped at Boyer Park & Marina / Snake River KOA in a Travel Trailer. The office has a store and small restaurant. The sign on Hwy 194, state Boyer State Park. We stayed here last fall and again in May this year. I feel this is a hidden gem. It is out of the way: Pullman is 45 minutes away and Colfax about 30 minutes. Once you are on the state highways the roads are narrow but in good shape. Having said all that, this campground is neat and clean, and quiet. It is on the Snake River and there is also a marina. The staff is courteous and helpful. It is under new management and is now a KOA branded facility. There are lots of big shade trees and the sites are wide and not close together. One of our favorite spots. We camped at Boyer Park & Marina / Snake River KOA in a Fifth Wheel. Call ahead to get the correct address for GPS. We camped here for four nights early in the season so there were only a few other campers there. The Manager was exceptional. Very helpful though they take a day off on Mondays and are a little difficult to reach. The store seemed well stocked though we didn't really use it much. The sites were clean, level, with all utilities very functional. The entire area is treed and right along the Snake River below the Lower Granite Dam. There is a small beach area, a marina, as well as very nice day use facilities. There are paved paths along the river going both upriver and down. We hiked both directions. Upriver takes you right up to the dam. There is a nice visitor center on the other side of the river at the dam. It's a little complicated to cross the dam, because you have to be escorted. Don't try to take a big camper across the dam because the route is a bit circuitous. The restroom/shower facilities were old, but clean and in good repair. Laundry facilities were minimal and old. Overall a very enjoyable camping experience for us. We camped at Boyer Park & Marina / Snake River KOA in a Fifth Wheel. This is a very nice campground which is well shaded, and is part of a marina on the banks of the Snake River not far from Pullman, WA. We stayed two nights in the off season, and still the park was pretty much full. During the summer this place could get real hot, and windy. There is only one road in, and it can be very steep and windy. That's the bad part. The good part is that this is a really nice place to stay. Most of those staying are probably fishing the Snake River. There are "Premium sites", regular sites, and sites with partial hookups. We used this as a base while attending a football game at Washington State University. Warning...the students at WSU know about this place, and in April and May will come here to hit the beach and party. They won't bother anyone in the campground. We camped at Boyer Park & Marina / Snake River KOA in a Fifth Wheel. 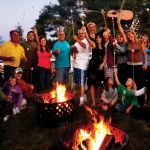 Are you affiliated with Boyer Park & Marina / Snake River KOA ?